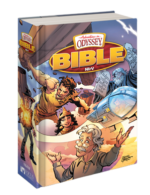 Back in April, the NIrV Adventures in Odyssey Bible was nominated as a finalist for the best Bible of the year by the Evangelical Christian Publishers Association (ECPA). The Christian Book Awards program is presented annually and honors the “best of the year” in 11 categories. This award recognizes the highest quality in Christian books and Bibles. When the Odyssey team begins a project, the standard for quality is always high, and you can expect nothing less. The awards ceremony was held on May 1, 2018. Although the Bible didn’t win, it was a high honor to be nominated. It’s interesting to note that the nomination was for “Best Bible of the Year” and not “Best Children’s Bible.” Being nominated for best Bible of the year is a high honor for our friends at the Odyssey team and for Focus on the Family. The Swindoll Study Bible won the 2018 award, but it was a high honor for the AIO Bible to be featured as a nomination alongside other great Bibles. The NIrV Adventures in Odyssey Bible is packed with great study aids for kids, including Whit’s Wisdom, Candid Conversations, Wooton’s Fun Facts, Jason’s Jargon, and “What’s It Mean, Eugene?” It also includes colorful maps, comic illustrations, devotionals, and much more. This Bible is a great resource for kids and families alike and helps bring the Bible alive. Read Focus on the Family’s original press release. See all the finalists for the 2018 Christian Book Awards.